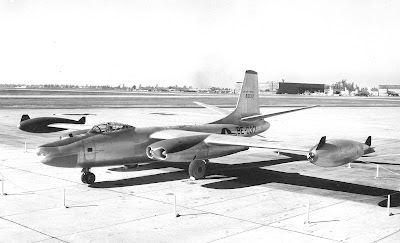 The North American B-45 Tornado was the United States Air Force 's (USAF) first operational jet bomber , and the first multi-jet engined bomber in the world to be refueled in mid-air. The B-45 was an important part of the United States 's nuclear deterrent for several years in the early 1950s, but was soon superseded by the Boeing B-47 Stratojet . B-45s and RB-45s served in the United States Air Force's Strategic Air Command from 1950 until 1959. It was also the first jet bomber of the NATO Alliance, which was formed in 1949. The B-45 began development in 1944, when the US War Department , alarmed by German jet bombers like the Arado Ar 234 , called for a new family of jet bombers grossing between 36,300 kg and 90,700 kg. The proposal from North American Aviation (NA-130) won, and on September 8, 1944, the company began production of three prototypes based on the NA-130. Armament : Guns: 2 × 12.7 mm M3 machine guns (Defensive). North American B-45 Tornado oli yhdysvaltalainen suihkumoottoreilla varustettu pommikone. Siinä oli suorat puolisuunnikkaan muotoiset, niin kutsutut trapetsin muotoiset siivet, sekä neljä siipiin ripustettua suihkumoottoria. Kaksi moottoria sijaitsi samassa moottorikehdossa. Yhdysvaltain stratigiset ilmavoimat (SAC) käyttivät konetta, mutta paremmat koneet, kuten Boeing B-47 Stratojet sekä B-52 Stratofortress, syrjäyttivät sen nopeasti. Konetyyppi oli ensimmäinen ydinpommituksiin pystyvä suihkukone. Siinä oli neljän hengen miehistö. Tuotantoa varten valittaessa oli kilpailijana Convairin XB-46, joka hävisi tarjouskilpailun. B-45 Tornadon ensilento tapahtui 17. maaliskuuta 1947 ja esittely 24. helmikuuta 1948. Palvelusura kesti kymmenen vuoden ajan, 1950–1959. Konetyypin valmistusmäärä oli 107 pommitusversiota A ja C, sekä 33 tiedusteluversiota RB-45C. 1950-luvun lopulta lähtien kykenivät ydinpommituksiin myös nopeat taisteluhävittäjät aina F-86 Sabresta lähtien. Tornadon hyötykuorma oli arviolta 22 000 paunaa (lb) eli noin 10 000 kg. Konetyyppiä käytettiin myös tiedusteluun ja valokuvaukseen, sillä se kykeni lentämään korkealla. Nämä versiot tunnettiin RB-45:na, ja ne osallistuivatKorean sotaan. Koneilla suoritettiin myös Itä-Euroopan alueen ilmatiedusteluja. The end of World War II resulted in the cancellation of many projects and delayed many others. In 1946, rising tensions with the Soviet Union caused the US Air Force to assign higher priorities to jet bomber development and production. By mid-1946, the XB-45 and Convair XB-46 neared completion, but the Boeing XB-47 and Martin XB-48 were still two years away. The USAAF chose to evaluate the first two designs to determine which would be superior operationally. The B-45 proved a superior design, and on January 2, 1947, a contract for immediate production of B-45As was signed. 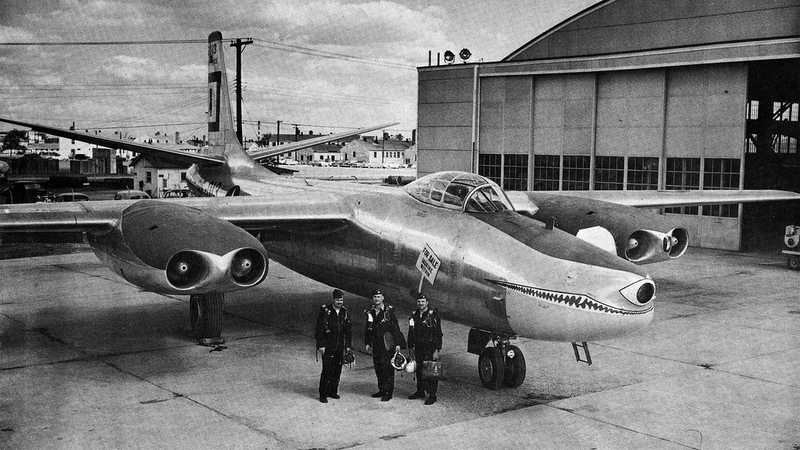 It had been planned to equip five light bomb groups and three light reconnaissance groups with B-45As, but as the B-47's development and flight-testing made future production all but certain, the future of the B-45 became increasingly uncertain, and in mid-1948 the US Air Staff began to question its value. Soon afterwards, President Truman's budget restraints reduced Air Force expenditure and B-45 production was reduced to a total of 142 airframes. Further budget cuts in 1950 forced the Aircraft and Weapons Board to cancel 51 of the 190 aircraft on order. 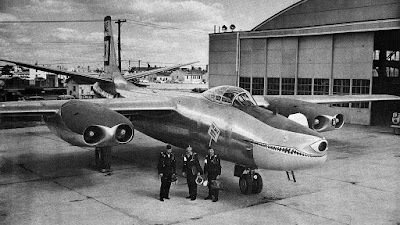 The B-45 was later replaced by the supersonic Convair B-58 Hustler. 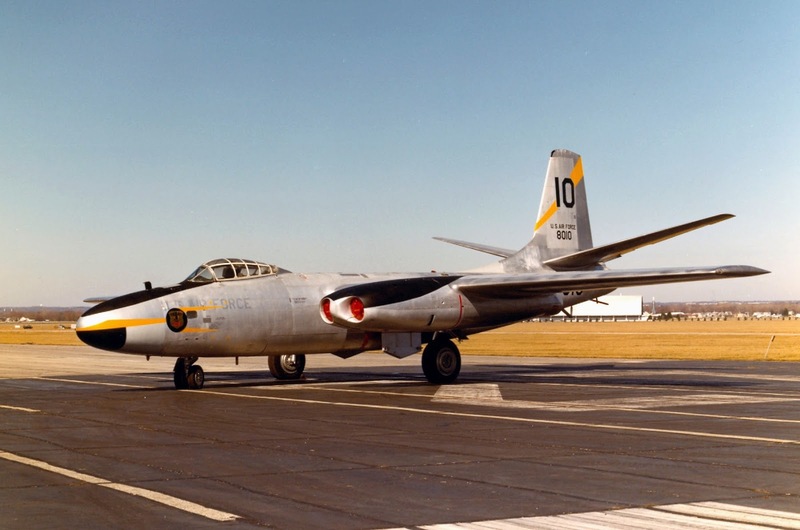 Continuously plagued by engine problems along with numerous other minor flaws, the B-45 regained importance when after the United States entered the Korean War in 1950, it proved its value both as a bomber and as a reconnaissance aircraft. The mass dedication of US forces to the Korean War revealed the vulnerability of North Atlantic Treaty Organization forces in Europe to Soviet attack, and it was in this light that the Air Force made an important decision about the future of the B-45. 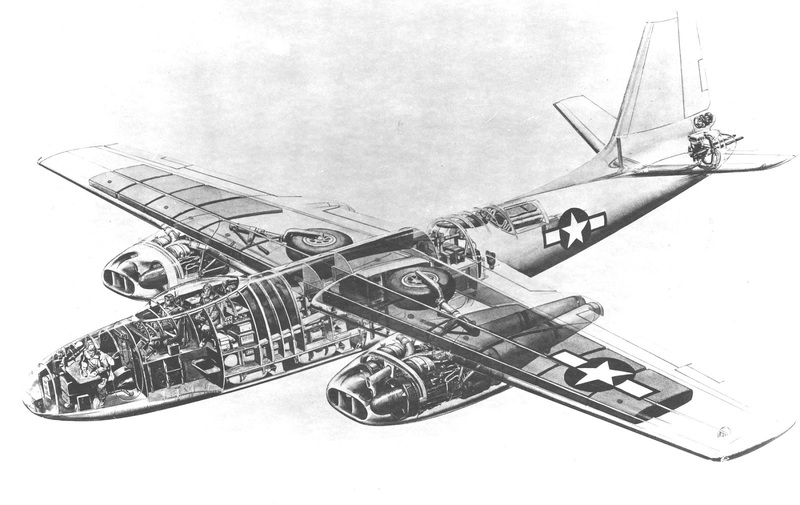 The B-45, like most post-World War II US bombers, could carry both nuclear and conventional bombs. The progress of weapons technology had led to a great reduction in the weight and size of nuclear weapons in the US inventory, effectively allowing smaller aircraft such as the B-45 to carry out nuclear strikes, a mission which had initially been limited to heavy bombers. Suddenly, the small fleet of B-45s had great value again as a nuclear deterrent. Operation Fandango, sometimes called Operation Backbreaker, entailed modifications to the aircraft for nuclear missions. In addition, the 40 B-45s allocated to the program were equipped with a new defensive system and extra fuel tanks. 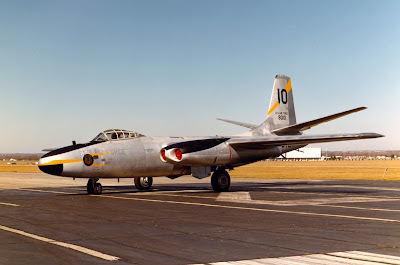 Despite the magnitude of the modifications project, plus ongoing problems with the early jet engines, atomic-capable B-45s began reaching the United Kingdom in May 1952, and deployment of the 40 aircraft was completed in mid-June. 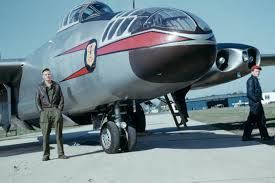 It was at about this same time that RB-45s of the 323rd Strategic Reconnaissance Squadron began to arrive in Japan to fly alongside the 91st Strategic Reconnaissance Squadron, supplementing the WWII era piston-engine R B-29s which had proved to be easy targets for North Korean MiGs. The RB-45s provided valuable intelligence throughout the remainder of the Korean War, despite the limited number of airframes which were available. RB-45Cs flew many daylight missions until early 1952, when they were converted to night operations after an RB-45 was almost lost to a MiG-15. All 33 RB-45Cs built were assigned to the 91st Strategic Reconnaissance Wing's 322nd, 323rd and 324th Strategic Reconnaissance Squadrons. The RB-45C also flew several long-range reconnaissance missions over the Soviet Union during the mid-1950s. On July 29, 1952, an RB-45C made the first non-stop trans-Pacific flight, having been refueled twice by KB-29 s along the way. Maj. Lou Carrington and his crew of the 91st Reconnaissance Wing flew from Alaska to Japan in 9 hrs 50 mins, winning the MacKay Trophy for their achievement. Within the 91st SRW, by 1954 the RB-45C had been replaced by the RB-47E. 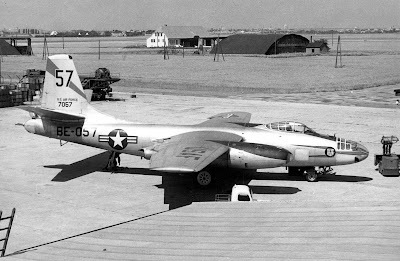 The phased-out RB-45Cs went to the 19th Tactical Reconnaissance Squadron, which operated them until they were withdrawn from operational use in the spring of 1958. The only other nation to use the RB-45C was the United Kingdom , where it was operated by an ad hoc unit of crews largely drawn from Nos. 35 and 115 squadrons. Whilst the USAF was prohibited by the President of the United States from overflying the Soviet Union unless under a state of war, US allies closer to the European theatre of war could. In the United Kingdom , whilst successive Labour governments had refused, the return of Winston Churchill and a Conservative administration to Downing Street had brought a change of options. As a result, under Operation Ju-jitsu , in July 1951 four aircraft were bailed to Britain from the 91st Strategic Reconnaissance Wing to form a Royal Air Force (RAF) Special Duties Flight commanded by Squadron Leader John Crampton. Stripped of all USAF markings and then applied with RAF markings, the four aircraft were attached to a USAF squadron based in RAF Sculthorpe, Norfolk in eastern England. The aircraft were tasked with flying deep-level reconnaissance missions over the Soviet Union to gather electronic and photographic intelligence. The Special Duties Flight conducted missions during the period 1952–54. On April 17, 1952, three aircraft were tasked to head for Kiev from Germany, scheduled to return to Sculthorpe ten hours later. Flying at 11,000 m, Crampton's aircraft was tracked by ground radar and came under anti-aircraft fire. Applying full power, he immediately turned and headed for Germany, none too soon, as Soviet night fighters had been dispatched to hunt down his aircraft. 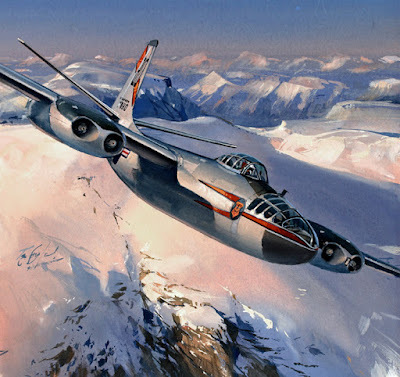 Subsequent flights over the Soviet Union were carried out using English Electric Canberras under the codename Project Robin , operating at higher altitudes of around 16,000 m. It was not until 1994 (under the "fifty-year rule" of the Public Records Act 1958) that the existence of the spy missions became public knowledge.